With a tasty treat in hand, Kathy Hogan gently guides Luca to the bedside of a hospice patient. Luca, a certified therapy dog, nuzzles closer and softly rests her head on the woman’s chest. Through Pets with Heart, Kathy and her husband, Garry, have been bringing Luca to the Good Samaritan Hospice floor at Heritage Valley Beaver for more than year. Their Tuesday visits are a cheerful part of the week for hospital administrators, hospice floor staff and just about everyone they meet in the hallway or on the elevator. “It’s a very special journey that families on the hospice floor are walking on and to be able to go with Luca and bring a little bit of sunshine in such a sad situation is just remarkable,” Kathy says. 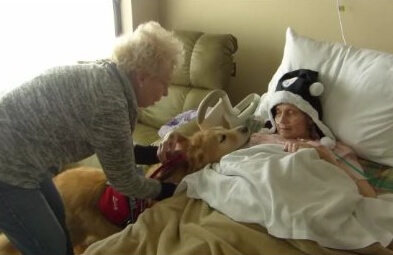 Working with a therapy dog was on Kathy’s “bucket list” of things she has always wanted to do. She noticed the Pets with Heart brochure while picking her own dog up from the groomer. She kept it and later recognized Sister Pat Montini and her golden retriever, Luca, while visiting a friend at Villa St. Joseph. Sister Pat and Sister Sharon Costello created Pets with Heart to offer comfort, joy and healing to God’s people. Together, the Sisters and their dogs offer a gentle presence to people at hospitals, schools, nursing homes and community centers. They are thankful for volunteers, like Kathy and Garry, who help spread the charism, or spirit, of the Sisters of St. Joseph.